A select group of Year 9 Computing students took a trip to Manchester Business School to work on a collaborative problem-solving challenge with a focus on community activism. The workshop, ran by The Transformation Trust in partnership with Dell, saw the students pitch innovative ideas based around improving the world using modern technologies. The day also saw University Ambassadors mentor the students during the project, as well as providing a tour of the campus to give an insight into what life is like in Higher Education. The whole day was a superb experience for these young people. 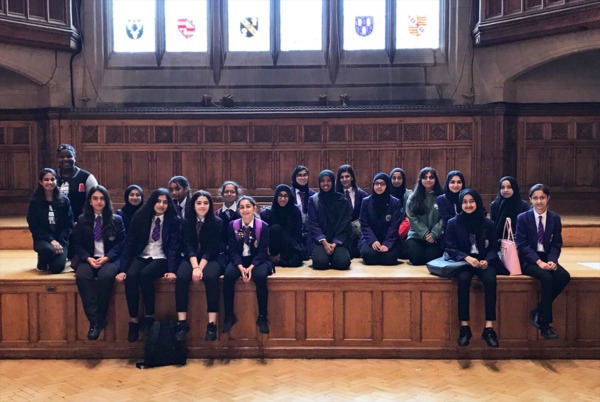 They were selected for their excellent work in Computing lessons across the year and thoroughly embraced the opportunity to work with a high profile company on this project. There were some interesting ideas pitched and it was great to see our young people deliver confident presentations in front of a large audience. We would like to thank the Transformation Trust, Dell and Manchester Business School for inviting us to be part of this project and look forward to working with them again in the future.